U.S. soldiers and K of C field secretaries stand outside of a K of C hut in Andernach, Germany, circa 1919. Photo by E.S. Brooke / Knights of Columbus. Our country celebrates Memorial Day on May 29th. As we remember those who died while serving our country – the Knights of Columbus should recall the significant sacrifice made by Brother Knights over the years and during many military engagements. The First World War was the first war with a major involvement by KofC members. Some 100,000 American members – including clergy and relief workers – were shipped “Over There” (to Europe) beginning in April of 1917. WWI officially began in July of 2014 and there were Canadian Knights fighting from the beginning. This month the Columbia On-Line edition has posted an article entitled: “During World War !, Knights from North America provided abundant Material and Spiritual support for the Troops“. The entire article can be viewed on-line – the link to the article can be found on our Facebook page (that link is available by clicking here). The following are some excerpts from the article. 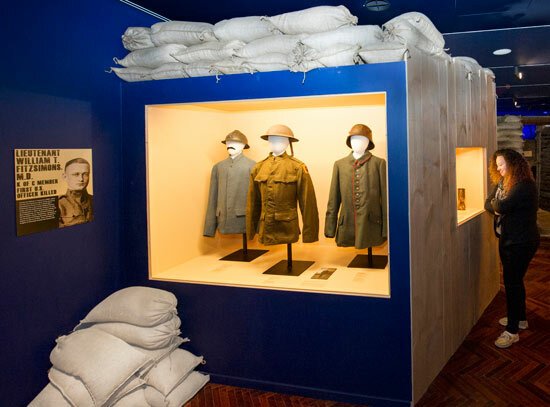 The Knights of Columbus Museum’s new exhibit, titled “World War I: Beyond the Front Lines,” features various galleries of artifacts & info. about the experience of servicemen during the Great War. Photo by Tom Serafin. Soldiers needed a respite from the war; they needed Mass and the sacraments. The Knights of Columbus came to the rescue, providing a major service with recreation centers, which became known as Huts. The K of C hut slogan was “Everybody Welcome, Everything Free.” No soldier or sailor had to pay a cent for anything the Knights gave them, nor would any free-will offering on their part be accepted by the secretaries who ran the huts. They gave everything free to whomever walked in, with no questions about religion, race or rank.